In the July 2010 issue of History (click here to download PDF copy or end of this article), Ian Jack advanced pictorial evidence in an endeavour to undermine my findings on the origins of Experiment Farm Cottage in my new book, Australia's Oldest House.1The National Trust, present owner of the cottage, maintains that it dates from the 1830s, which if true would mean it has little architectural or historic importance. Australia's Oldest House examines the life of John Harris, the first owner, and the evidence relating to the cottage's age. In it I conclude that the weight of evidence indicates that it was built in the 1790s, making it the oldest house in Australia, and one of the most influential in introducing the verandahed bungalow, a characteristic Australian house type ever since. For the 1790s it was a very sophisticated domestic structure. The book also draws attention to the NSW National Trust's inadequate engagement with historians. It criticises the Trust for a superficial interrogation of historical evidence and their failure to abide by the principles of the ICOMOS Burra Charter in the management and conservation of Experiment Farm Cottage. I am delighted to have this opportunity to discuss the pictorial evidence because the early pictures of Parramatta underline the issues at the very core of Australia's Oldest House. Firstly, their calibre as direct evidence and secondly, the use made of pictures in historical and conservation methodologies. 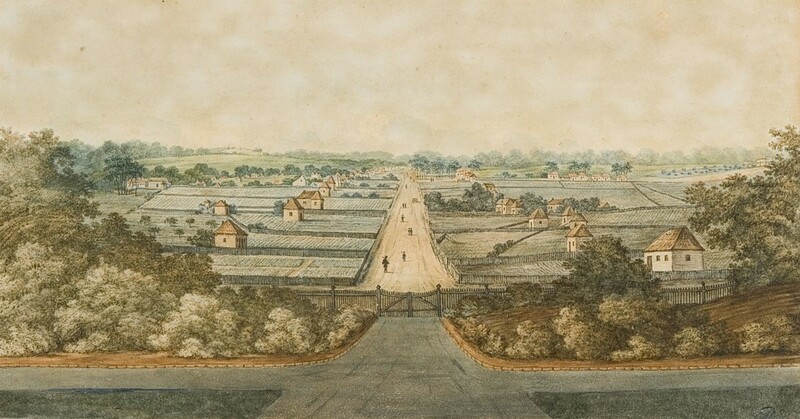 The earliest image to consider was painted by George Evans in 1805 from the front of Government House, Parramatta and at the western extremity of George Street [Figure 1]. The original measures 17cm by 33cm. A claim has been made that the house in the middle distance on the extreme right behind an extensive garden is the first Experiment Farm Cottage'and that today's building which is different in appearance is therefore not the one that existed in 1805. However it is essential to look at corroborative evidence in the landscape. George Street ran from Government House to the wharf at the head of the river with houses set in gardens on both sides. These are clearly evident in the view. Experiment Farm Cottage was located beyond the eastern extremity of George Street, yet in this view, the house mooted as being Experiment Farm Cottage is closer to the midpoint of George Street, south-east of the first cross street and overlooking the George Street houses that continue well beyond to the eastern horizon. We also know that Experiment Farm Cottage was located south of the barracks and store, neither of which is visible in this view. Conceivably the siting of the house is due to perspective decisions by the artist, but without any record of his intentions, we cannot presume he displaced the cottage for reasons of perspective. Depictions in watercolour of remote buildings in broad landscapes take on an impressionistic form and cannot be relied on for architectural detail. This is particularly apparent in Evans's 1805 view where there is detail in the foreground that dissipates toward the horizon. It is a small picture, capturing an extensive area. Evans had no inkling that digital enhancement would facilitate minute examination of remote landscape elements and load his artistry with documentary significance. So we cannot know from his painting the actual details of the house, neither can we accept that it represents Experiment Farm Cottage. It has also been suggested that the building on the far left in an 1811 view is the three-storey government store and that Experiment Farm Cottage is the substantial building to its right. But limitations like those applying to the 1805 view prevent us treating this picture as representing the cottage. Next is an 1813 engraving [Figure 3]. 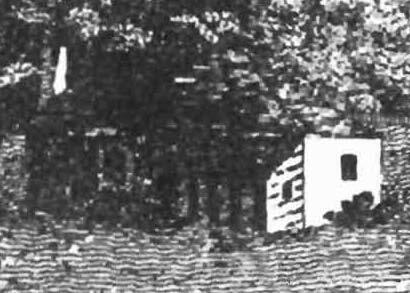 Dr Jack claims that the cottage depicted in an extract from this [Figure 4] is the original Experiment Farm Cottage, and distinctly unlike the present building. This is a general view from the south-east, again without unequivocal indicators of precise locations. There is no apparent reason why Experiment Farm Cottage would be the little cottage shown in Figure 4, rather than the larger cottage in the mid-ground to the right extracted in Figure 5.This larger cottage has an outbuilding at the rear that might correspond to the detached kitchen of Experiment Farm Cottage. 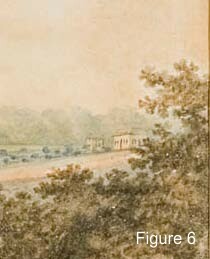 Complicating the matter, a re-examination of Evans 1805 water colour [Figure 1] shows there is another building constructed at right angles to the cottage claimed to be Experiment Farm Cottage. It can also be seen similarly situated in this engraving. A case might be made that Figure 5 depicts the barracks, but uncertainties concerning the configuration of the barrack buildings at that time make it problematic. Problems with proximity to the river and other buildings, and perspective issues, preclude definite identifications. Further, the building in Figure 4, having no outbuilding, cannot be identified with the cottage in Figure 1, claimed to be Experiment Farm Cottage, which does have an outbuilding, running at right angles to the main house, as shown in Figure 6. If the 1805 view depicts Experiment Farm Cottage, then consistency demands that it is the larger building in the 1813 engraving, the one shown in Figure 5. There are too few signifiers to ascertain the identity of any of these structures. The pictorial evidence simply does not have the probative value to support either view of the dating of the present Experiment Farm Cottage. This is not an issue that historians should be prepared to settle with conjecture and subjective interpretation. To identify the smaller cottage in Figure 4 as Experiment Farm Cottage would also require us to accept that Dr and Mrs Harris moved into it from the newly renovated two storied Ultimo House [Figure 7] and lived there in 1820 and 1821, and that Harris conducted the Court of Petty Sessions in it at that time. That notion would challenge the credulity of anyone familiar with Harris's life and times. 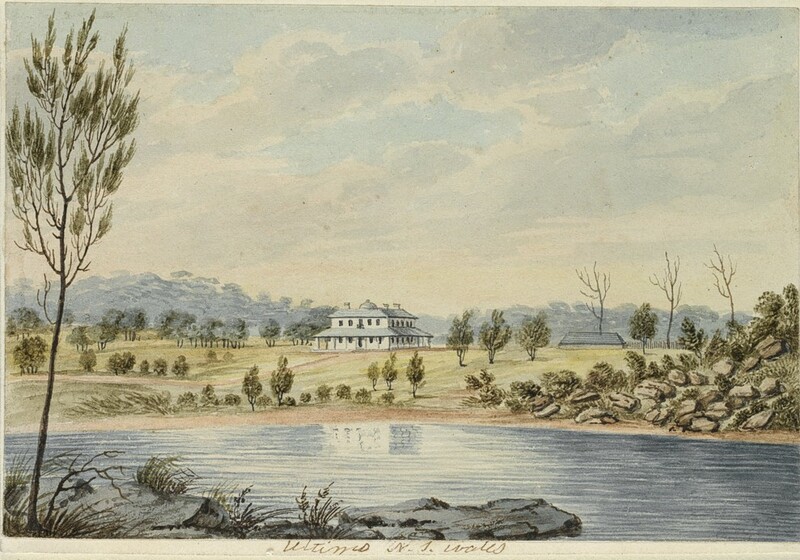 In contesting my claims in Australia's Oldest House, Dr Jack refers to Elizabeth Macarthur's 1839 letter, mentioning her near neighbours the Campbells 'who have occupied a new cottage on the Estate of the late Dr Harris', a letter composed contemporaneously with Conrad Martens's sketch of Campbell's house. He is convinced that Australia's Oldest House is wrong in identifying the Campbell's new home as the two storey house appearing in Martens's work. 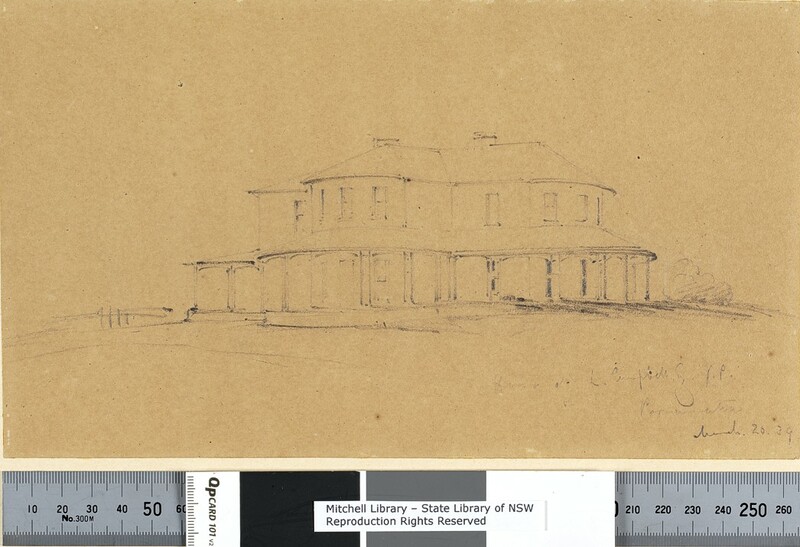 Martens sketched the new house in a drawing titled: House of L Campbell Esq. J.P. Parramatta 20 March 1839. [Figure 8] The architectural detail indisputably shows that Campbell's house was not Experiment Farm Cottage. Land tenure documents show that Campbell had purchased the land on which he built from Samuel Marsden, east of Marsden's house, Newlands. 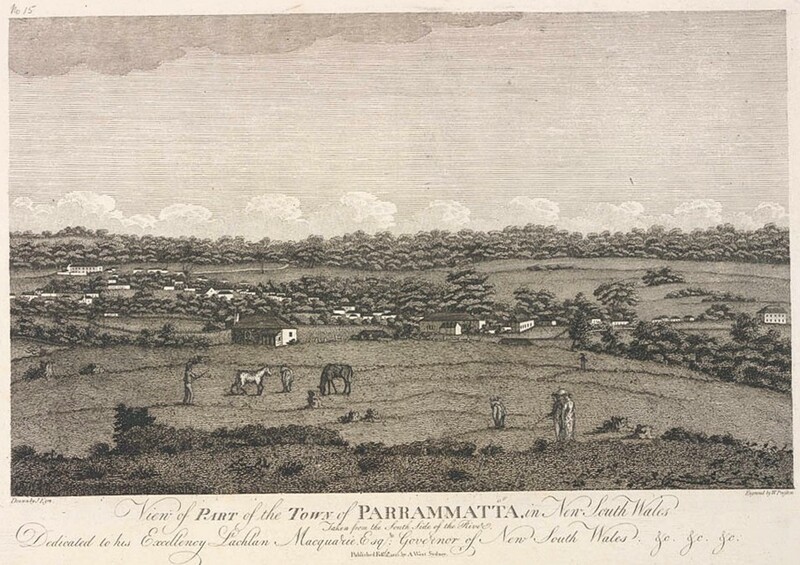 Martens completed his Parramatta from grounds of H.H. Macarthur in 1839 [Figure 9]. 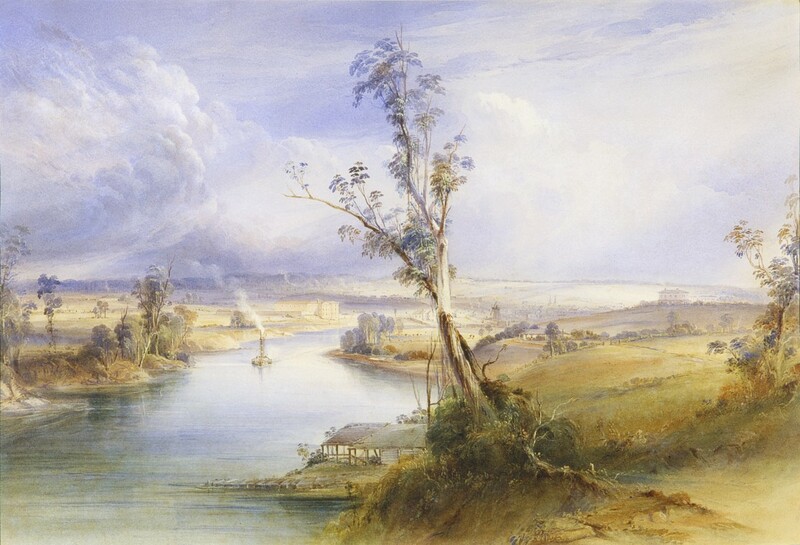 We can be confident that the house it shows on the rise above the river is Campbell's, rather than Newlands as claimed by Dr Jack, because only one house is depicted there, and Campbell's house was between Martens's painting position at Vineyard to the east, and Newlands, further west. If Newlands was depicted there would be two houses in this area, Campbell's and Newlands beyond. 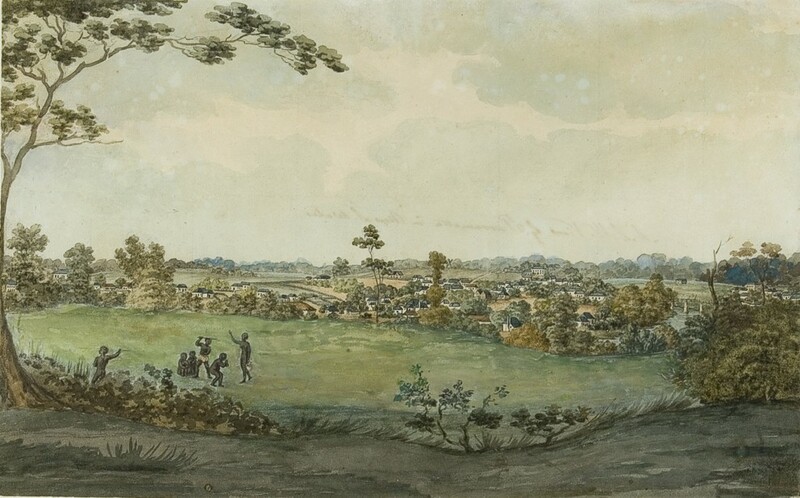 Newlands cannot be seen inParramatta from grounds of H.H. Macarthur because it is beyond the line of sight from Martens's vantage point. 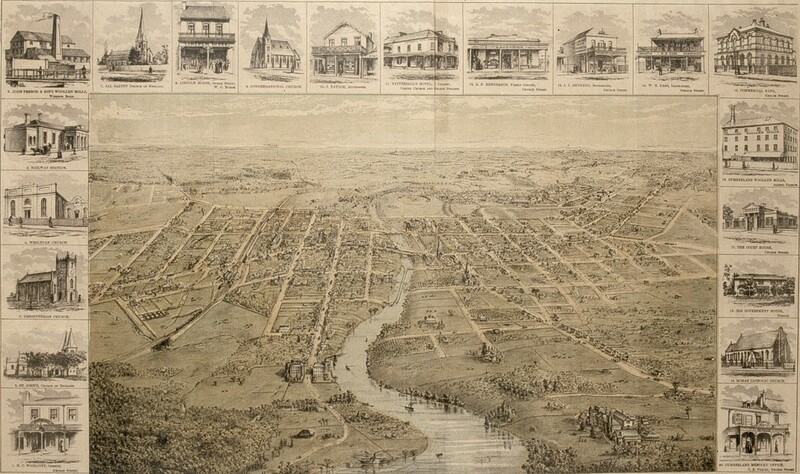 The situation and relationship of the two buildings is evident in the 1879 Birdseye View of Parramatta [Figure 10], where there has been attention paid to the detail of individual structures. The Birdseye View is quite a different art form to Martens's water colour landscapes and valuable corroboration. These images emphasise the point that the identification of architectural details in broad views is unreliable because they are impressionistic. In contrast, the sketch by Martens with Campbell's house as the sole subject is far more credible, because the house is the focus of the work. We also know, thanks to Martens' account books and his labelling of the works that Campbell purchased a copy ofParramatta from grounds of H.H. Macarthur at £15.15.0 and two copies of a painting of his house at £3.3.0. Would Campbell really have engaged in such expenditure if it was not truly his house, but Marsden's Newlands? Corroborative evidence from land tenure documents and Martens' accounts justifies confidence in the identification of the Campbell. The pictorial evidence clearly fails to establish that Experiment Farm Cottage is not Australia's oldest house. Neither can it prove my conclusion that the cottage was built in the 1790s. That is why the book presents a much broader array of evidence, and a study of Harris himself. No document has been produced by the National Trust which analyses the evidence for the later date proposed for Experiment Farm Cottage. Without coherent analysis of all the evidence within its historic context, the management, conservation and interpretation of Experiment Farm Cottage have been compromised. The importance of considering each piece of evidence in the context of all the evidence cannot be overstated. This is the difference between a reliable evidentiary approach and wishful thinking. 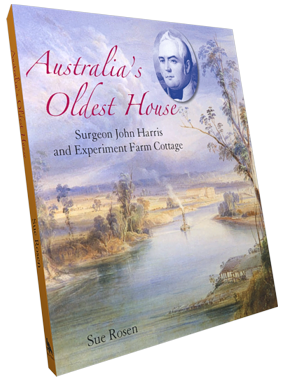 1 Sue Rosen, Australia's Oldest House: Surgeon John Harris and Experiment Farm Cottage, Halstead Press, Sydney, 2010.